The Obama campaign has apologized to two Muslim women excluded by campagin volunteers from appearing on stage at a campaign event this week at Detroit’s Joe Louis Arena so that the candidate would not be photographed with supporters that are visibly identifiable as Muslim. 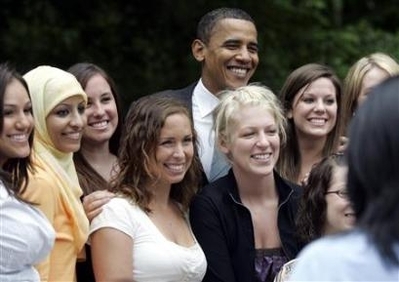 The next day, Obama did appear in this photo-op at a community college with a hijabi. Disappointing to say the least. Even though these incidents are being blamed on misinformed campaign volunteers, it reminds me of the coolly political way he threw the Rev. Jeremiah Wright “under the bus” and his church when it became politically inconvenient for him and gives me pause to think what the next campaign issue or policy will get the same treatment but given the alternatives, I’m still not voting for McCain or Barr. Obama and his campaign don’t mean a thing to me. I’m not so saavy around the congress and senate websites to see what his stances are on some laws and bills. That’s a fault of mines and I think the majority of the American people. What does Obama stand for? We know what McCain is going to do, but in some speeches Obama’s been giving he doesn’t sound too different from McCain on some issues. I hope he doesn’t conform who he is for the presidency or compromise too much for this election because then he’ll have debts to pay and those debts are worse than monetary,we can’t allow him to be subordinate to lobbyists things. I know he banned lobby contributions but, those big groups in washington giving money or whispering in the ears of these politicians have done enough damage on our system and has made many of our so called representatives deaf to real people issues. It’s fine if Obama does not move you, I find his stances on some issues particularly galling, yet I’d still vote for him over the other crop of candidates presented. I wonder though, which position he will abandon next when it becomes politically inconvenient or if he will take a principled stand. Ultimately, I think the whole thing could have been a political strategy to include Muslims. Lets be clear, had the sisters appeared on stage, it would have been the talk of all right wing radio, FOX news, etc.. etc., particularly amongst the right-wing crowds that send emails, that he is a Muslim and he is soft on terror. By framing this the way it has been done and publicly apologizing and calling it a “terrible mistake,” now paves the way for Muslim to be more involved with public events, unapologetically, in fact this almost ensures that during his next public appearance, especially television, they’ll recruit Hijabis to be front and center. This greatly reduces the right-wing spin-machine propaganda. But Apple, agree with you, at this point he will disown his mother for political convenience. Don’t be surprised, if information surfaces about Obama’s Muslim relatives on his father’s side. I agree with Actionable. If he would have included Muslims in the background he would have been further ripped by the right-wing media for supposidly being a Muslim… and there are even country Democrats who are refusing to vote for him because they believe that he IS Muslim. So I understand this situation and I am not at him. On top of that Obama has taken pictures with Muslims before this, there was a hijabi in blue once and even in a blue abaya it seemed— who took pictures with him with a group of girls. So while this picture may seem staged, he has taken pictures before with hijabis. It’s certainly possible and would resemble political desperation but I don’t think it was staged as Obama has appeared on a number of other occasions with visible Muslims in much smaller settings before this campaign rally. But then again, the strange thing to me is that from watching snippets of the rally on youtube, the lighting is so dark on stage and there are so many signs waving that hardly anyone is visible behind Obama. His reversal on accepting public funds is just one more issue that got thrown under the bus. I think I might begin to keep a tally the way Slate does on Bushisms and Obamaisms on the issues Obama discards, sacrificing principle for expediency.